“Don’t ask a man where he is from. If he is from Texas he will tell you so. Man, can I tell you how much I love getting away to my little ranch house in Kerrville?!?!! On Monday I texted my wife asking her if she wanted to take off for a brief respite with the kiddos at the place I have spent most of the summers of my childhood – the Texas Hill Country. She didn’t miss a beat and by Wednesday we were on the road (leaving at 4AM) with a Suburban full of kids and Willie Nelson’s “Red Headed Stranger”. Kerrville didn’t disappoint! Most people don’t know my background when it comes to Kerrville with story upon story of time spent riding horses, dancing at Crider’s, playing “pitch” with my cousins, swimming and fishing in the Guadalupe River and making memories with my relatives (aunts, uncles, cousins and all). I might’ve grown up in the groomed plains of West Texas but my summers were all Texas Hill Country. And now I get to pass on that heritage to my boys. Our place is actually not in Kerrville or anywhere else to be exact. The closest town (if you can call it that) is Hunt, Texas, but Kerrville is the closest “large” city. It’s like saying you live in Houston when you really live in League City. However, our place is right in the middle of camps where families spend literally thousands of dollars to send their children (in fact, our neighbors will send their girls to a camp this summer not even five miles from our ranch house), and I’m blessed to get to do it all for free! The last four days were chock-full of long hours in the waters of the ‘Lupe, searching through the rough terrain of Big Bluff looking for who-knows-what and even had a little bit of Crider’s thrown in. 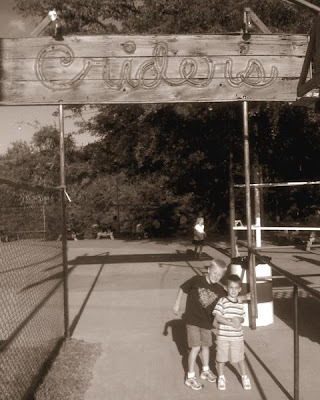 We missed the dance and rodeo (had to leave a little too soon) but did hit Crider’s catfish cookout with the locals. Fortunately, all of my aunts and uncles happened to be around to invest in my kids over the week with old stories, swimming buddies and rides on the tractor. Standing around in the midst of it all, seeing the smiles and wonder ignite on the faces and in the hearts of my boys was pretty special for me. I knew the feeling. In fact, I still feel it today.